Composite or PVC decking requires none of the maintenance that wood decking does. It resists staining, fading, scratching, rot, and will stay looking great for the life of your deck. The most economical choice, decks built from brown pressure treated lumber are durable and stainable, but will require high maintenance to keep looking nice. Priced in between pressure treated and composite, cedar is a beautiful wood for decks. A softer wood, it is naturally rot and insect resistant and more structurally stable than pressure treated. Also requires high maintenance to keep looking nice. We build front porches from all types of materials including top quality composites and PVC. 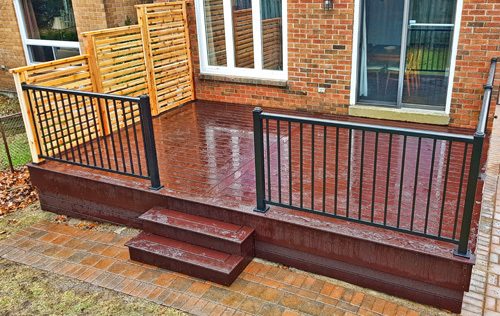 Seen here are PVC columns and skirting, composite decking and aluminum railings. We offer roofed (shingled) or unroofed structures of all shapes and sizes. A pergola can create a great space over a patio or deck.